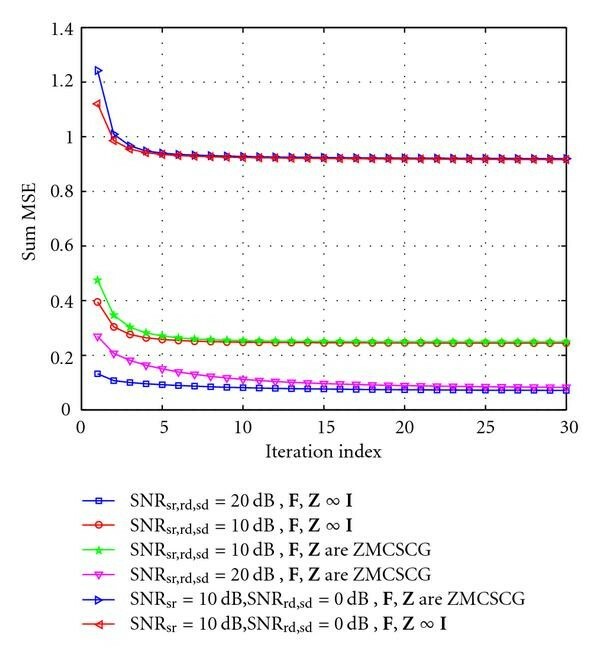 The problem of jointly optimizing the source precoder, relay transceiver, and destination equalizer has been considered in this paper for a multiple-input-multiple-output (MIMO) amplify-and-forward (AF) relay channel, where the channel estimates of all links are assumed to be imperfect. The considered joint optimization problem is nonconvex and does not offer closed-form solutions. However, it has been shown that the optimization of one variable when others are fixed is a convex optimization problem which can be efficiently solved using interior-point algorithms. In this context, an iterative technique with the guaranteed convergence has been proposed for the AF MIMO relay channel that includes the direct link. It has been also shown that, for the double-hop relay case without the receive-side antenna correlations in each hop, the global optimality can be confirmed since the structures of the source precoder, relay transceiver, and destination equalizer have closed forms and the remaining joint power allocation can be solved using Geometric Programming (GP) technique under high signal-to-noise ratio (SNR) approximation. In the latter case, the performance of the iterative technique and the GP method has been compared with simulations to ensure that the iterative approach gives reasonably good solutions with an acceptable complexity. Moreover, simulation results verify the robustness of the proposed design when compared to the nonrobust design that assumes estimated channels as actual channels. The application of relays for cooperative communications has received a lot of interest in recent years. 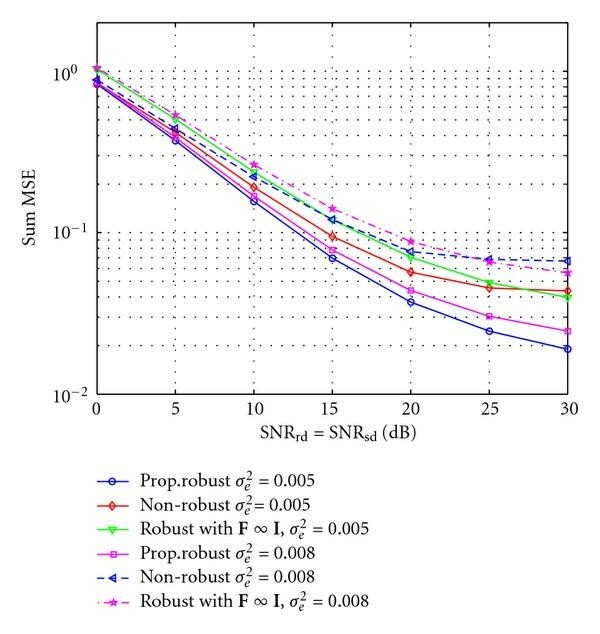 It is well known that the channel impairments such as shadowing, multipath fading, distance-dependent path losses, and interference often degrade the link quality between the source and destination in a wireless network. If the link quality degrades severely, relays can be employed between the source and destination nodes for assisting the transmission of data from the source to destination . In the literature, various types of cooperative communications such as amplify-and-forward (AF), decode-and-forward , coded-cooperation , and compress-and-forward  have been presented. In , the outage and ergodic capacities have been analyzed for a three-node network where one of the nodes relays the messages of another node towards the third one. Among several cooperation schemes [1–4], the AF scheme is more attractive due to its simplicity since the relay simply forwards the signal and does not decode it. Recently, space-time coding strategies have been developed for relay networks . In , the authors study distributed beamforming for a cooperative network which consists of a transmitter, a receiver, and an arbitrary number of relay nodes. The common things among aforementioned works are that the transmitter, receiver, and the relays are all single-antenna nodes and the channel state information (CSI) (either instantaneous or second-order statistics of the channel) is assumed to be error-free. The performance of cooperative communications can be further enhanced by employing multiple-input-multiple-output (MIMO) relays . The optimal designs of AF MIMO relays have been investigated in [8, 9] for point-to-point and in [10, 11] for point-to-multipoint communications assuming that the available CSI is perfect. The robust design of MIMO relay for multipoint-to-multipoint communications has been solved in , where the sources and destinations are single antenna nodes. The optimal design of multiple AF MIMO relays in a point-to-point communication scenario has been considered in [13, 14] to minimize the mean-square error (MSE) and satisfy the quality of service (QoS) requirements. These works also assume perfect knowledge of CSI. Recently, the joint robust design of AF MIMO relay and destination equalizer has been investigated in  for a double-hop (without direct link) MIMO relay channel. To the best source of our knowledge, the joint optimization of the source precoder, MIMO relay, and the destination equalizer has not been considered in the literature for the case where the CSI is imperfect and the direct link is included. Although the path attenuation for the direct link is much larger than that for the link via relay, due to the fading of the wireless channels, there can be still a significant number of instantaneous channels during which the direct link is better than the relay link. As a result, we consider the direct link in our analysis and exploit the benefit provided by the relay channel in terms of diversity. Moreover, in practice, channel estimation is required to obtain the CSI, where the estimation errors are inevitable due to various factors such as the limited length of the training sequences and the time-varying nature of wireless channels. The performance degradation due to such estimation errors can be mitigated by using robust designs that take into account the possible estimation errors. As a result, robust methods are highly desired for practical applications. The robust techniques can be divided mainly into worst-case and stochastic approaches . The worst-case approach [17, 18] considers that the errors belong to a predefined uncertainty region, where the objective is to optimize the worst system performance for any error in this region. The stochastic approach guarantees a certain system performance averaged over channel realizations . The latter approach has been used in  to minimize the power of the transmit beamformer while satisfying the QoS requirements for all users. In the sequel, we use stochastic approach for the robust design. In this paper, we deal with the joint robust design of source precoder, relay transceiver, and destination equalizer for an AF MIMO relay system where the CSI is considered to be imperfect at all nodes. A stochastic approach is employed in which the objective is to minimize the average sum mean-square error (If the channel estimation is perfect at the receiver, the minimum mean-square error (MMSE) matrix can be related to the rate using the relation . However, if the receiver does not have perfect estimation of the channel, the relation between the rate and MMSE matrix is not straightforward. Consequently, for our current system model where both the estimates of source-relay and relay-destination channels are imperfect, deriving rate expression and solving the optimization problem based on that expression are still an open issue.) under the source and relay power constraints. The considered joint optimization is nonconvex and also does not lead to closed-form solutions. However, it has been shown that the optimization of one parameter when others are fixed is a quadratic convex-optimization problem that can be easily solved within the framework of convex optimization techniques. We first propose an iterative approach both for the MIMO relay channels with and without the direct link. Although the iterative method guarantees fast convergence for the case with the direct link, the global optimality cannot be proven since the joint optimization problem is nonconvex. As a result, in the second part of this paper, we limit the joint optimization problem for the case without the direct link in which the source-relay and relay-destination MIMO channels have only transmit-side antenna correlations. In the latter case, it is shown that structures of the optimal source precoder and relay transceiver have closed forms, where the remaining joint power allocation problem can be approximately formulated into a Geometric Programming (GP) problem. 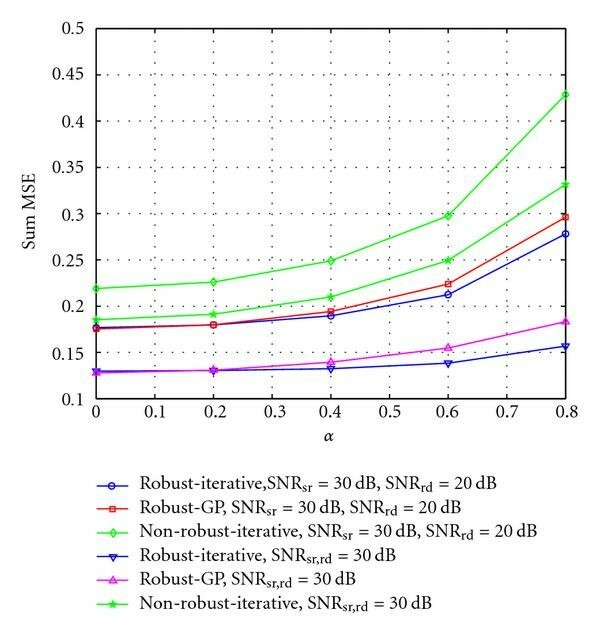 With the help of computer simulations, we compare the solutions of the iterative technique and the GP approach under high signal-to-noise ratio (SNR) approximation for the case without the direct link. This comparison is helpful to conclude that the iterative approach gives reasonably good solutions with an acceptable complexity. The remainder of this paper is organized as follows. The system model for MIMO relay channel is presented in Section 2. In Section 3, the iterative approach is described for jointly optimizing the source precoder, relay transceiver, and destination equalizer for the MIMO relay channel with the direct link. The closed-form solutions and the approximate GP problem formulation are provided in Section 4 for the MIMO relay channel without the direct link where single-side antenna correlations have been considered for source-relay and relay-destination channels. In Section 5, simulation results are presented to show the performance of the proposed robust and nonrobust methods, and in Section 6, conclusions are drawn. Upper (lower) bold face letters will be used for matrices (vectors); , , , , , and denote conjugate, transpose, Hermitian transpose, mathematical expectation, identity matrix, and Frobenius norm, respectively. , , , denote the matrix trace operator, vectorization operator, space of matrices with complex entries, and the Kronecker product, respectively. The constraints of the optimization problem (20) do not depend on and . As a result, the optimal and can be easily obtained in terms of and . Unfortunately, after substituting such optimal and into the objective function of (20), the resulting objective function in terms of and appears to be a nontractable nonconvex problem. This fact will be later shown in this section. The joint optimization problem (20) is a nonconvex problem and does not offer closed-form solutions. However, it can be easily observed that the considered problem is a convex problem over one optimization variable when others are fixed. Hence, we propose to solve this optimization problem using iterative technique, where each optimization variable is updated at a time considering others as fixed. The iterative algorithm may be implemented as follows. The destination estimates the source-destination and relay-destination channels and the relay estimates the source-relay channel, separately with the help of training sequence. The relay sends the estimated source-relay channel to the destination where the iterative algorithm is executed. The destination feedbacks optimally designed and to the source and relay, respectively. The channel is considered to remain constant within a block but vary from one block to another, where the block consists of training signal and useful data (Notice that the adaptation of the source precoder and relay transceiver matrices in fast fading scenario can be impractical if the design is based on instantaneous channels . Therefore, robust designs based on channel covariance information  can be appropriate for such a scenario. ). It is worthwhile to mention here that the minimization of the sum of the source and relay powers under the MSE constraint can also be solved by using the iterative framework that we are proposing in the sequel. Moreover, the quality of fairness approach such as minimizing the sum of the source and relay powers while fulfilling the SNR/MSE requirements of each symbol stream can also be handled by the proposed iterative method. For conciseness, the latter two methods are not considered in this paper. The sum MMSE of the MIMO relay system with the direct link is upper bounded by the sum MMSE of the direct link and source-relay-destination link. The results of (27) and (28) prove the Lemma. It can be seen that the minimization of (26) under source and relay power constraints is a nontractable problem. We have noticed that even in the case of the nonrobust design, such an objective is difficult to handle. This difficulty has motivated us to use the iterative optimization based on the MSE function (17) for which and have been already determined in terms of and (see (21) and (23)). In the following, we show the optimizations over and when other variables are fixed. where , , and the quadratic inequality constraint is converted to a linear matrix inequality constraint (LMI) using Schur-Complement theorem . Notice that when other variables are fixed, can be optimized by solving the Karush-Kuhn-Tucker (KKT) conditions, where the Lagrangian multiplier that arises due to the relay power constraint can be obtained by using the bisection algorithm like in . However, in order to make the proposed iterative approach applicable for other related problems briefly discussed in the beginning of this section and also for the optimization over in the sequel, we propose to formulate our optimization problem in the convex form , which has been proven to be computationally efficient and flexible to accommodate even a large number of convex constraints . The iterative algorithm for joint optimization of , , and . Initialize the algorithm with and such that the source and relay power constraints are satisfied. Update using (21) and (23). Update by solving the convex problem . until both is smaller than a threshold , where the index denotes the th iteration. In the case of the relay channel without the direct link, the optimization problem over destination equalizer, and can be iteratively solved by omitting all terms containing and in (23), , and . If the channel estimates are perfect, (21), (23), , and can be changed to shorter forms by using the fact that . The resulting equations and optimization problems correspond to the perfect CSI case. The computational complexity of Algorithm 1 mainly depends on the work loads of the convex optimization problems and which consist of second-order cone (SOC) as well as SDP constraints. An enormous amount of effort will be required to compute the exact computational complexity of and , and thus their exact complexity analysis is beyond the scope of this paper. However, using the results of , we determine the worst-case computational complexity of and . In , there are SOC constraints where the first SOC constraint has a dimension (also the size of the cone) with real variables and the remaining two SOC constraints have the same size of . The SOC constraints in consist of real optimization variables. The only one SDP constraint of has a size of with real optimization variables. Therefore, according to , the computational load of per iteration is . The number of iterations required can be upper bounded by . Hence, the overall worst-case complexity of is . Similarly, we can compute the worst-case computational load for . The first SOC constraint in has a size of while the other SOC constraints are of the same size of . The SOC constraints consist of real optimization variables. Like in the case of , the single SDP constraint is of size with real optimization variables. Thus (see also ), we find that has a work load of per iteration, where the required number of iterations is upper bounded by . As a result, the worst-case complexity of is . Notice that in practice the interior-point algorithms used for solving and behave much better than predicted by the aforementioned worst-case analysis . It can be shown that the proposed iterative method converges. It has been already discussed that the optimization problem is convex w.r.t. each variable when the others are fixed. For the given and , the solutions given by (21) and (23) correspond to the MMSE receiver. As a result, we have . Similarly, for the given , , and , the optimization problem (20) is convex w.r.t. and, thus, the problem provides optimal solution for which means that . Finally, for the given , , and , problem (20) is convex w.r.t. and, hence, the problem gives optimal solution for thereby confirming . Therefore, it can be found that with each update of , , , and , the objective function decreases and the iterative method converges. It will be later shown via numerical results that the iterative algorithm gives satisfactory performance with acceptable convergence speed. However, the global optimality of the solutions of the iterative method for the relay channel with the direct link cannot be guaranteed as the joint problem is nonconvex. In the next section, the joint optimization problem will be restricted to a double-hop MIMO relay, where receive antenna correlations are assumed to be negligible for each hop. In this case, the optimization problem turns to the joint power allocation, for which the global optimality can be guaranteed under high-SNR approximation. which is a GP problem that can be solved efficiently to guarantee the global optimality. Notice that the joint power allocation problem is nonconvex even for the case without channel estimation errors . In such a nonrobust design, it has been shown in  that the lower and upper bounds can be established for the MSE for each data stream. Unfortunately, this is not the case for the proposed robust design due to the fact that the terms , , and are again functions of for all and for all . It is also worthwhile to note that several optimization problems which can be solved using the GP method and still provide solutions close to the optimal solution of the sum MSE minimization problem are; (a) maximization of the minimum of the SNRs of the data streams and (b) maximization of the geometric mean of the SNRs of the data streams, both under the source and relay power constraints. In all cases, the optimization problems , , and (53) are solved using the CVX software . The SNRs for source-relay, source-destination, and relay-destination channels are defined as , , and , respectively. Throughout all examples, we take dBw and vary the values of and to change , , and . The estimated channels are generated according to (7), so that the elements of actual channels , , and have the variance of 1. For all results, we compute the average MSE by taking 200 realizations of the estimated channels. The convergence behaviour of the proposed iterative method as a function of iteration index is illustrated in Figure 2 for the relay channel with the direct link. The parameters in this figure are set as , , , and . We take three sets of SNRs as dB, dB and dB, and dB. It can be seen from this figure that the iterative method converges in about 15 iterations. The convergence is faster for the lower values of the SNR. The effect of different initializations on the convergence behaviours of the iterative method is also displayed in Figure 2. The convergence speed for the cases where and are initialized to randomly generated matrices of ZMCSCG random variables is similar to the cases where and are initialized to the matrices proportional to identity (i.e., and ). Moreover, it can be noticed from Figure 2 that different initializations lead to the similar solutions. In Figure 3, the performance of the iterative method as a function of the iteration index is illustrated for the relay channel without the direct link. We take , , and in this figure. As a reference, the performance of the GP problem which gives optimal solution under high-SNR assumption is also displayed in Figure 3. It can be noticed from Figure 3 that the difference between the solutions of the iterative method and GP method is negligible after 10–15 iterations. Convergence behaviour of the iterative approach for different initializations with the direct link ( ). 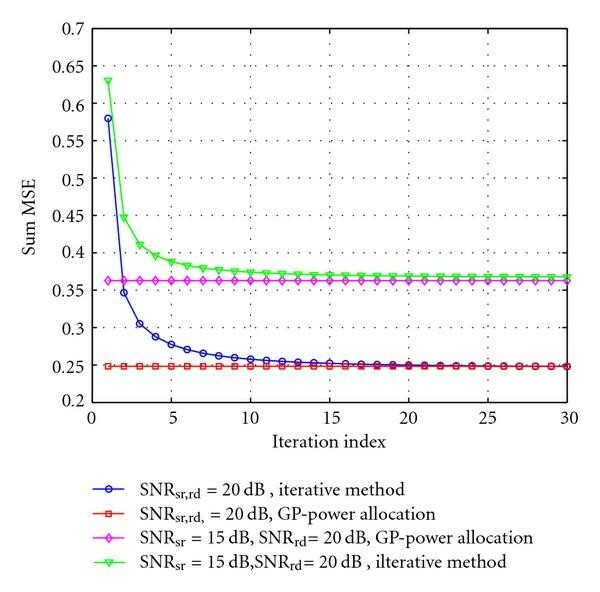 Convergence performance of the iterative approach and the GP power allocation method for the case without the direct link ( ). The performance of the proposed iterative method for the MIMO relay channel with the direct link is shown in Figure 4 for different values of . The performance of the nonrobust method which considers the estimated channels as actual channels and the performance of the robust method without a source precoder  (the case with where is the positive scaling factor chosen for satisfying the source power constraint) are also displayed in this figure. We keep , , and dB and change and from to dB. The threshold for stopping the iterative process is set to . It can be noticed from this figure that in all cases, the MSE decreases when the SNR increases and when the variance of the channel estimation error decreases. Furthermore, the proposed robust design outperforms both the nonrobust method and the robust method with . In Figure 5, the performance between the proposed iterative method and the GP power allocation method for the relay channel without the direct link is compared. This figure displays the sum MSE as a function of the correlation coefficient for different values of and . We keep , and for Figure 5. It can be observed from this figure that the proposed robust methods significantly outperform the nonrobust method. Moreover, the performance gap between the iterative approach and the GP power allocation method is negligible for . For , the iterative approach outperforms the GP method. In all cases, the sum MSE increases with the increasing values of correlation coefficient. Sum MSE as a function of SNR (SNRrd = SNRsd) for the relay channel with the direct link ( ). Sum MSE as a function of α for the relay channel without the direct link ( ). The problem of jointly optimizing the source precoder, relay transceiver, and destination equalizer for a cooperative MIMO relay system has been treated in this paper. An iterative approach with the guaranteed convergence has been proposed to solve the nonconvex problem. It has been shown that for the case without the direct link where the two-hop MIMO channels have only transmit-side antenna correlations, the joint optimization turns to the joint source and relay power allocation problem which has been solved by using GP technique under high-SNR approximation. Simulation results confirm the efficiency and good performance of the iterative approach for the MIMO relay channel with and without the direct link. Furthermore, the proposed robust methods significantly outperform the nonrobust method when the channel estimates are imperfect. This work is supported by the European project NEWCOM++, the Wallone region project COSMOS, and the concerted action SCOOP. B. K. Chalise is currently with the Center for Advanced Communications, Villanova University, Villanova, PA 19085, USA, (Phone: 1-610-519-7371, Fax: 1-610-519-6118, Email: batu.chalise@villanova.edu). L. Vandendorpe is with the Communication and Remote Sensing Laboratory, Universitè catholique de Louvain, Place du Levant, 2, B-1348 Louvain la Neuve, Belgium, (Phone: 32-10-472312, Fax: 32-10-472089, Email: luc.vandendorpe@uclouvain.be). The first author completed his part of contribution when he was with the Communication and Remote Sensing Laboratory, Universitè Catholique de Louvain.